Mt. 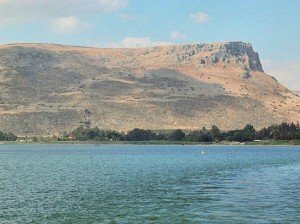 Arbel, Galilee, Israel – This high mountain, overlooking the Sea of Galilee, affords one of the most breathtaking views of the area that Jesus spent most of his public ministry in. Josephus tells us that there were over 200 towns and villages around the lake called the Sea of Galilee during Jesus’ day. Almost all the people living there earned their living by farming or fishing. From the top of Mt. Arbel, you have a panoramic view of the whole area where Jesus walked and lived. You can see Capernaum, Bethsaida (where the Jordan River empties into the lake), the Mt. of Beatitudes, Korazin, and the Decapolis (home of the demoniac). A lot of Jewish history is also in this mountain. Herod the Great came here and killed hundreds of Galilean Zealots that were hiding in the steep cliffs on Mt. Arbel to crush their rebellion against his authority. The mountain is a landmark in the area and can be seen from almost anywhere for miles in any direction. Rabbis were passionately committed to the young men that they had chosen as their disciples. They felt totally responsible for their physical and spiritual growth and well being. It was a common practice for a rabbi to get up early in the morning, well before light and make a very strenuous climb to a place where they could overlook where their disciples were sleeping. The harder the climb for the rabbi, the more it emphasized his commitment to his flock. After reaching his observation point, the rabbi would look below and begin to earnestly pray to God on behalf of his disciples. He would pray large portions of the text out loud and ask God to make those scriptures come alive in the hearts of those young men under his tutelage. It was a very gratifying experience for the teacher as he pleaded to God on behalf of his unsuspecting students below. After just making this tough climb ourselves, we could feel the commitment and the sacrifice that the rabbi had for his talmidim. He was willing to do the hard work it took to make sure that they became just like him and were instructed correctly. We then read the Mark Passage and saw that our Rabbi Jesus also got up early in the morning and went out to pray for his disciples. Who are your disciples? According to Matthew 28:19-20 Jesus instructed us to go and make disciples and to teach them to do everything that He had taught us. Are you earnestly praying for them and their walk with Jesus? If we are to become like Jesus, we will have to have disciples and we will have to commit to praying for them. It will take a high level of commitment on our part. Mt. Arbel burned in my spirit the need to be a man that lives and prays the text and that is actively pursuing someone to train to walk in the footsteps of our Rabbi, Jesus. I’m so grateful to Him, that He directed me to your w-site. It’s so much like Him, the way He likes to encourage me, a kind word from a friend, a big hug from a cabdriver ( I never knew before) or this time, Mt.Arbel, praying for disciples. He is so good to us, the only One worthy to be praised. I’ll share your link with my kids back home and my students here in VN.